The Berklee experience is ongoing. I started my 14th year there this Fall ’17 semester. I never thought I would be doing what I am doing and am quite blessed to have this position as it’s a great gig. Growing up in LA and immersed in learning music I had certainly heard of Berklee. As I said in a prior installment many months ago, after high school I attended LA Valley College. “Valley’s” music department had a great rep. So many of the young San Fernando valley musicians that I either knew or heard about had gone there. My mentor Jay Graydon is the one that recommended I attend, telling me that playing in the Jazz “A” big band was the goal. I entered and played in the “B” band, and in my time there never made it to the “A” band. 🙁 Dan Sawyer had that gig sewn up! (Uh, can you say “Second Call”?) 🙂 Valley had just a ton of great student musicians including Dan, Greg Mathieson and Scott Page, who were all there when I was. The other two colleges at the time that guys I knew were thinking of attending were UCLA and of course Berklee. I left LA 21 years ago and do miss it at times. I’m from the Burbank/Glendale area and have so many fond memories of growing up there. I do however remember when I first started touring, when I was in my early 20’s, going to cities across the US and they seemed so attractive. The whole urban center thing that LA does not have looked really good to me. Toronto and Boston were my fav’s. Before leaving LA I had the opportunity to do quite a few sessions in Toronto with producer Tim McCauley. Beautiful town. I was in Boston in July of ’75 with Eddie Kendricks for a week and just fell in love with the place. We were playing for the week at the club Paul’s Mall which was down the street from Berklee. I mentioned all of that all the way back in week three of this blog. Every year for the past 6 years I have gone back ‘home” with a Berklee scholarship event. 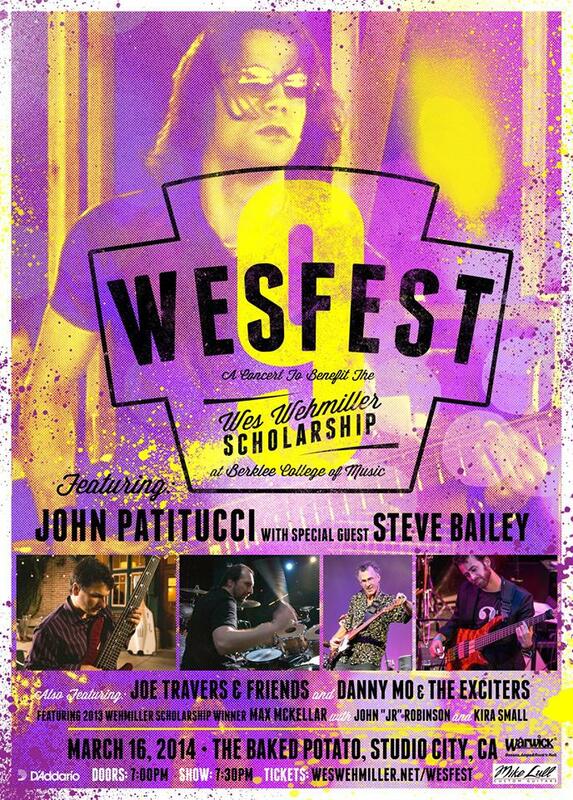 The event is a concert for the Wes Wehmiller Scholarship fund. Wesfest it’s called. Berklee faculty member Danny Morris heads this thing up. We play a show in LA raising funds for the scholarship. We started out at the Roxy in Hollywood, then a few years ago moved to the Baked Potato in Studio City. Here is a flier from the 2014 show. I play with Danny Mo and The Exciters, with my buddy John Robinson on drums and the amazing Kira Small on vocals and a host of other great players and vocalists in that band. Always a great time. Here is the song “A Little Help From My Friends”, from one of the concerts at the Roxy. I am way over to the right behind the backing vocalists. I make an appearance close to the end, but my former student Steve Stout is getting lots of air time. Smokin band! 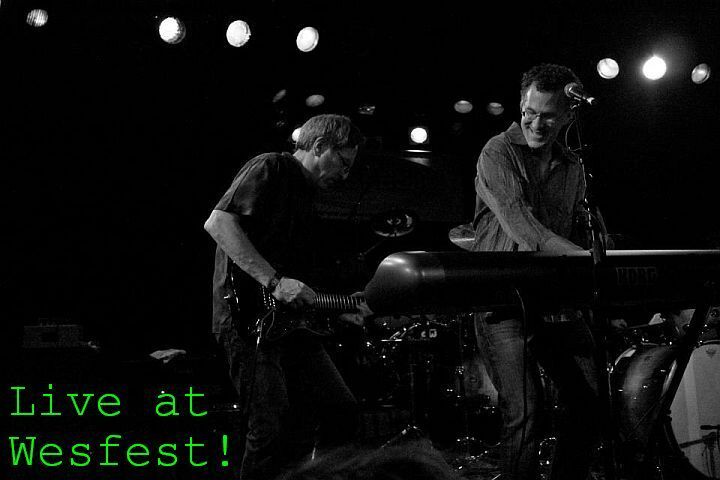 Last year when we did Wesfest 12 I had a day off and was remeniscing about the college days. I drove from the Sportsman’s Lodge where I was staying with Libby, (Lib was at the pool, Nice!) a few miles down the road to Valley College. What a trip, I couldn’t believe how small the music dept was. There have been many improvements at the campus but the music wing is exactly as I left it so many years ago. Like a time warp walking in there. I shot this video if you care to watch, not a biggie unless you were a student there back then. It sure does not look like the Berklee campus! This was actually an amazing trip to LA. The weather was perfect. 80 degrees in the valley, the pool was 85. We had flown in on Friday March 10th, I played the show on the 12th and we were flying out on Tuesday the 14th. One problem though. Huge snowstorm back east. Turns out we could not fly into Boston until late Friday night the 17th. Woe is me, 🙁 days by the pool! 🙂 Since we had time I decided to go find the house my friend Michael Umphrey lived in that Hendrix once lived. 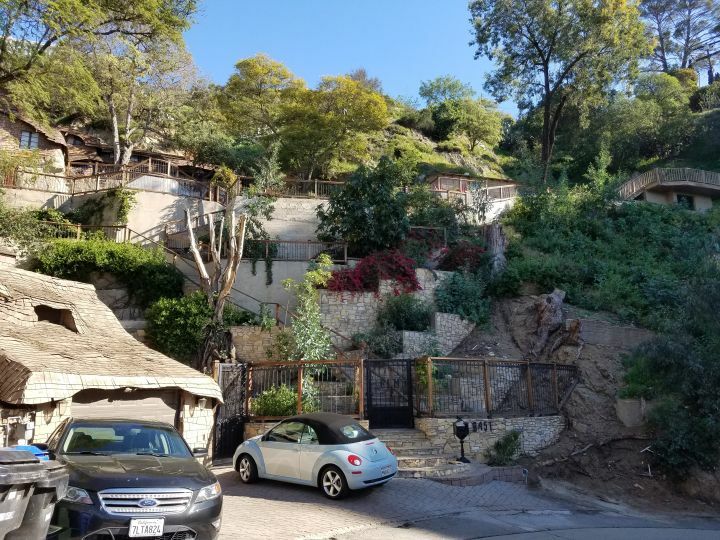 It’s up off Laurel Canyon, great times there. This is where my musical relationship with Michel Colombier all started. It looks quite different from when Michael was living there, so much so I had to call him up and describe it to make sure it was the right place. It apparently was built by Charlie Chaplin, and a guy walking his dog told me David Crosby used to live there as well. We fly back home and I finish out the Spring 2017 semester. To close this episode out I have to share a video of one of my ensembles with you. One of the perks of teaching at Berklee is that the children of the teachers can go there tuition free. This is big, tuition at the college is huge $$. My son Eric who had already graduated from Massachusetts College of Liberal Arts with an art degree decided that his real passion was music. Eric graduated from MCLA in 2013 and in the Fall semester of 2014 enrolled at Berklee. In his last semester at Berklee he signed up for one of my ensembles! Here is a video I shot of a rehearsal. The song is by Florence and The Machine, called “Cosmic Love”. Two guitarists, Eric is the one in the middle of the video. Thanks for reading! Next week I am going into the making of my instrumental solo record “The Total Plan”. 20 years in the making and loaded with lots of musician friends I have worked with over the years.